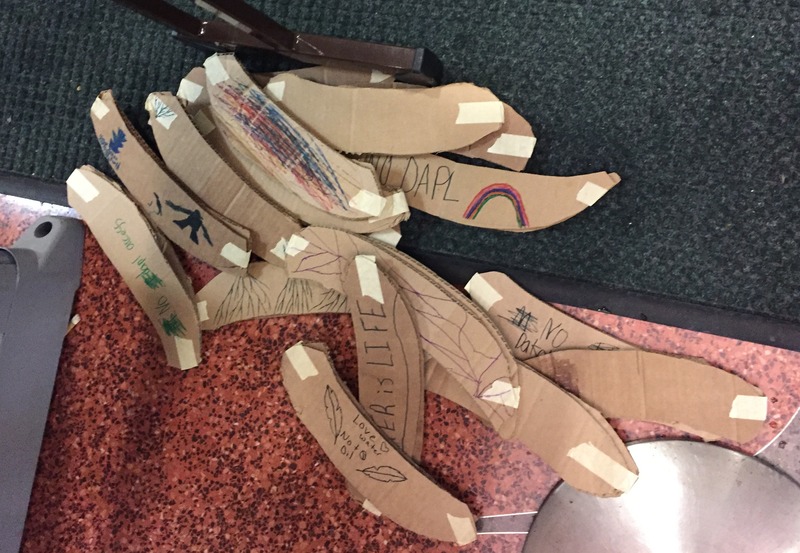 When did a cardboard canoe hat made by a child with the words “Water is Life” become a protest, something that needs to be suppressed for the public well being? Quick background: On March 7, the U.S. State Department held a public meeting in Bemidji to consider a border crossing for a Canadian oil tar sands pipeline. There was a strong turnout and over-the-top security. I wrote a blog for the Sierra Club critical of the event. What I didn’t know at that time was Sanford Center security in Bemidji did not allow young children to wear their handmade cardboard canoe hats inside. It is apparent that not all of the canoe hats had written words. Some of it is simply kid art on the side … The question is, what lesson are the kids learning? The Smithsonian has acknowledged its error. The State Department and Sanford Center security have not. The National Museum for the American Indian spokesperson Eileen Maxwell said it was incorrect for security to ask the women to remove their jackets with the patches and pins, according to the ICMN story. Maxwell further noted that the Smithsonian does not prohibit political messages on clothing, but it does prohibit bringing in signs on posts and the displaying of banners of any nature in the museum. “In this one instance, one officer misinterpreted this rule,” Maxwell said. I have tried to get similar clarity on the decision to ban the canoe hats at the Bemidji event. I called and emailed Jeff Van Grinsven, head of security for the Sanford Center and Christopher Rich, Deputy Director for the Office of Policy and Public Outreach for the U.S. State Department’s Bureau of Oceans and International Environmental and Scientific Affairs. Van Grinsven said in an initial phone interview that the canoe hats were not confiscated, and referred additional questions to the State Department. I emailed him a photo of the canoe hats (above) on Monday morning with follow-up questions. He has yet to respond. The State Department’s Rich said in an email. As for security at the meeting, we relied on the professional advice of local law enforcement officials. I was not aware that children’s canoe hats were confiscated, and am not sure why this would have occurred. Comments: I, for one, had not heard about the Enbridge shooting and I am sure I was not alone. It would have been helpful for security to give people an explanation of the perceived need for metal detectors. Attendees also should have received advanced warning about the excessive screening — that bags, purses and even water bottles would not be allowed. Lastly, the assumption seems to have been a pipeline opponent did the shooting. There does not appear to be any evidence that was the case, at least from media accounts. To repeat from the earlier blog, the format was flawed. Attendees could ask State Department staff questions. But there was no public discussion, no opportunity to speak directly to decision makers or hear others testify. People had to submit comments in writing or speak privately to a stenographer. Thank you for sharing your blog and your concerns about the March 7 Bemidji meeting with us. I am disappointed and sorry that you felt mistreated, and that you thought that the meeting failed to engage the public. We designed the open house format of the event specifically with public engagement in mind. The purpose of the meeting was to help explain the findings of the environmental impact statement (the Line 67 Draft SEIS), and to elicit public comments on the proposed project. We brought a number of experts who worked on the statement so that they could engage the public. From what we observed during the meeting, they were able to do this. We received a large number of comments. Comment: This response is dismissive. He doesn’t acknowledge something that shouldn’t be that controversial — that people want to speak to someone in charge about their concerns. The State Department says, “from what we observed,” the public was successfully engaged. That’s not a very scientific poll. I am sure if they would have surveyed those who attended, they would have received a different answer.